"Late In Life Drug Use"
Season four, in comparison, has been a more formless contraption, throwing a lot of sketches at the wall without having much thought to connectivity or continuity. As my colleague Kate pointed out in her review of this week’s spectacular Inside Amy Schumer, episodes of sketch comedy reach a higher level when it feels like the varied bits are interwoven with purpose, and there hasn’t been a lot of that this year. Occasionally the show is able to reach maximum potential in its randomness—the terrific “Spyke Drives” is an example of that—but it lacks the heights and connective tissue of the Alexandra/new mayor/bed-and-breakfast arcs from last year. “Late In Life Drug Use” is a casualty of this, peppered with fun moments yet lacking anything to make it truly stand out. 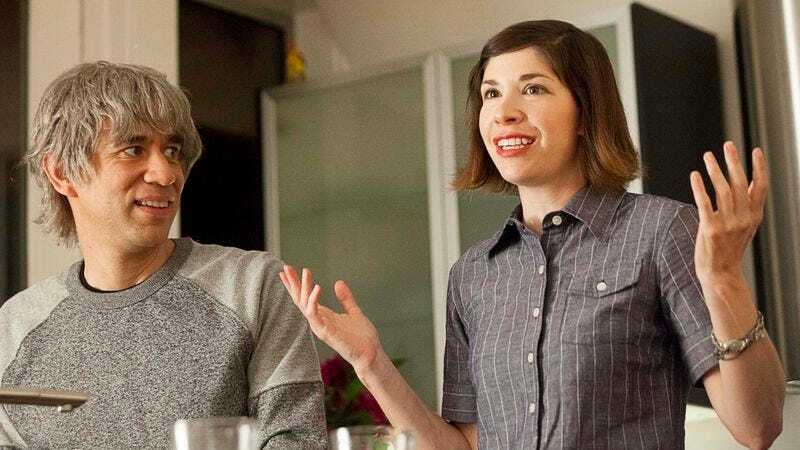 The titular sketch about drug use takes us to one of Portlandia’s less prolific couples, well-meaning but overreaching parents Brendan and Michelle. After a guest at their dinner party tells them the story of a weekend drug experience (a disappointingly superfluous use of Jeff Goldblum), he plants the question in their heads of whether or not they’re too old to do drugs for the first time. They decide they’re not, and pour a lot of effort into making the most carefully planned unexpected event. 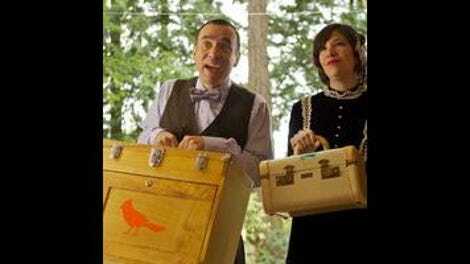 (“I want to approach this like we would buy a car.”) As always, it’s reliably funny for Portlandia to walk through how much its residents overthink activities that are supposed to be fun and simple, and Brownstein gets good mileage out of trying to plan a drug experience around dentist trips and meetings. The problem with the narrative is that as far as main characters, Brendan and Michelle don’t feel like the right choices for this story. Last seen in season three’s “Squiggleman” they haven’t left as much of an impression as a half-dozen other couples that Armisen and Brownstein play, and their use here is a few steps away from the overanxious parenting sketches they normally play a part in. There’s some of that as they record goodbye messages to Grover (“Don’t follow trends, try not to listen to electronic dance music – I think that’s just going to be a phase”) and explain the mechanics of the panic room to their babysitter, but it feels distracting to the lost weekend arc of the sketch. The biggest misfire is that the sequence spends all its time building up to Brendan and Michelle taking drugs, and then spends comparatively little time on the experience of taking drugs itself. Rather than rendering the altered way Brendan and Michelle see the world, it drops their disoriented selves in front of their babysitter to the point that she’s the one doing the majority of the reactions. It illustrates the unspoken fact that the majority of the time when you use drugs you’re just fucked up as opposed to having an adventure, but given Portlandia once showed Dave and Kath going on coyote vision quests and tearing rabbits apart in their pajamas, there was a golden opportunity for some acid trip weirdness and they wasted it. What also works against “Late In Life Drug Use” is that while the wraparound sketch is frequently the best part of a Portlandia episode, half of the other sketches feel like they should have taken that extra time themselves. Exhibit A for this is the introduction of Carrie’s brother, who’s recently come out to the family and is bringing his boyfriend Nick (played by Josh Homme of Queens Of The Stone Age and Nick Swardson of Nick Swardson’s Pretend Time respectively), and the two behave like a pair of frat boys rather than the stereotypical gays that Fred and Carrie are expecting. There’s a good joke buried in here about stereotyping, but the whole process rolls out too fast between when the new couple is introduced and when they’re changing their lives. It’s a three-act story compressed into a few minutes, and that doesn’t build much investment in either side. Similarly, the opening sketch also moves too fast to reach the punchline, and is doubly frustrating for wasting a Kyle MacLachlan appearance. The Mayor is so disillusioned by the lack of weirdness in the town’s LGBT community that he cancels the entire pride parade, and the backlash forces him to find another group of outcasts, which he does by recognizing bigots. Between the predictable result and the promptness with which the Mayor washes his hands of the affair, the sketch is tonally off—and also problematic, as no matter how oblivious the Mayor this makes him seem like more of a bad guy than we’re accustomed to. It’s also hurt by the snippet in the closing credits where they debate grave robbers as another option (“G-R-A-V-E! No one stays dead to me!”), which creates the disappointing feeling they planned a much better runner sketch about finding “the new weird” that had to be abandoned and the spare parts used as bookend filler. While most of “Late In Life Drug Use” didn’t work for me this week, there were a couple sketches that were genuinely fun. The best sketch features Spyke and Iris trying out a new Thai place only to find out the food is awful, and rather than rail at the restaurant they direct their anger towards the alt-weekly that named it best Thai in the city. Here’s one of Portlandia’s expert leaps into implausibility as it the alt-weekly staff is revealed to be the operators of the restaurant, and that the publication exists solely to promote the restaurant. It’s the degree to which everyone invests in the publication that elevates the story, the pacing of the sketch matched well with Spyke’s growing enthusiasm for the endeavor—which then loops around to make his new job working in the restaurant kitchen. And when all else fails, there’s always puns! Punslingers, a new business established by Phil and Gigi of Bad Art Good Walls, continues the pair’s tradition of contributing cringe-worthy services by establishing terrible puns for businesses. It’s a laundry list of terrible puns as the two debate names for Italian restaurants—Venice the Menace, Planned Pizzahood, Pizza Paul & Mary—and optometrists—TGI Framedays, Spect-ocular—names made funnier by the clinical reactions of the other party. (“That’s so dumb.” “Thank you.”) Although the closing pun made on the name of the United States isn’t as epic as the buildup would indicate, there’s still plenty of earnest groans to be found in the endeavor. And in a week where most of the material feels half-baked, one appreciates a few cheap laughs. This Week In Portland: While it might not be weird enough for the Mayor, the Portland Pride Festival is an institution in the city and will be celebrating its 20th anniversary this June. Adding to the lack of connectivity, no Portland Pet Haven sketch for the second week in a row. The sketch where Toni and Candace become riled up by two officers looking for information on a string of break-ins in the neighborhood also suffers, though that’s less from connectivity than it is from simple fatigue. After the two were used so well last week in “Trail Blazers Dancers,” this is a retread of a half-dozen other sketches that play on their general distrust of men, simply amplified to 11 now that it’s the Man in their shop. On the topic of hallucinatory experiences, there’s also a sketch where Armisen and Brownstein play trees who storm into a woman’s house, horrified at her banal use of the moleskin journals they died for. Not much to say except the costumes are fun. The insistence of the restaurant owner/editor that his teenage employee is Dan Savage is made funnier by the fact that Savage appears earlier that episode as one of the representatives of Portland’s LGBT community. Michelle, charting out the plan for their literal/metaphorical trip: “This spiral represents drug day.” Makes me wonder if there’s a Portlandia/True Detective crossover in the cards, with artisanal stick sculptures and beer can men, Carcosa being the latest target of gentrification,and the Mayor discussing the idea of time as a flat circle.